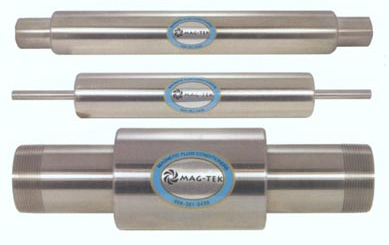 Transportation - MagTek Inc. - Making the world a safer and cleaner place. The Problem: Diesel fuel begins to degrade almost as soon as it is refined. Fuel breakdown and degradation are accelerated by transportation, storage, exposure to heat, engine pressure, condensation microbial contamination, cracking, blending, etc. 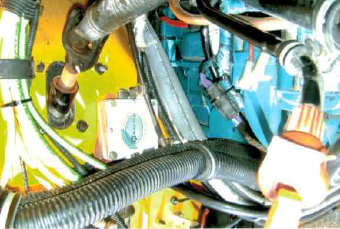 The resulting fuel sediments, not even visible at first, damage fuel injection equipment, clog filters, cause power loss, deposit sludge in tanks, and may ultimately result in injection and engine failure. 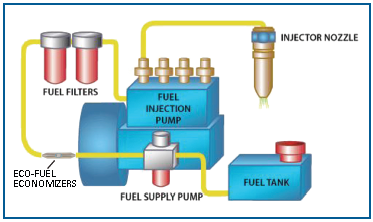 Compromised fuel injection systems do not burn fuel completely. Your costly fuel becomes a pollutant instead of a power source. Fuel costs soar! The Solution: Mag-Tek's Eco-Fuel Economizer reverses the degradation process and returns particulates to solution. The result is a cleaner, faster, more complete combustion that transfers more power to the axle and reduces fuel loss. It also keeps tanks and fuel lines free of sludge and solids. No additives are necessary. We can help you cut costs from the minute you install our tools. How it Works: Developed from the same technology and patent used by major oil companies to treat crude oil for “paraffin and asphaltene” these units are engineered for large diesel engines with recirculating fuel systems. They have been tested and proven to provide fuel savings and fewer emissions, and lower requirement for repairs on highway tractors, buses, large standby generators, and marine engines. Please feel free to call for a free, no-obligation consultation - 956-289-1406. Single cell organisms, or microbes - live and multiply in diesel fuel. These organisms are composed of a membrane filled with cellular fluid and electrolytes. Their life function depends upon a balanced electrical charge over the cell membrane. Any disturbance to this delicate balance is highly detrimental to the cell’s life-sustaining functions such as metabolism and reproduction. The process of transferring kinetic energy into electric energy by means of a magnetic field is known as induction. The Eco-Fuel Economizer provides a powerful and focused magnetic field through which the fuel is directed. This causes induction to occur in the microbes, when the fuel passes through the unit. The microbes break apart, and burn up when the fuel is burned in the engine. for specific applications. such as downhole drilling, ships, locomotives, and mining equipment. A magnetic field is applied to ionize the fuel feed and combustion chamber; enhancing combustion mechanisms leading to lower hydrocarbon emissions. The ECO-FUEL ECONOMIZER fights bacterial contamination and unnecessary side effects by reducing the particles that form sludge and result in dirty fuel. The ECO-FUEL ECONOMIZER is a decontamination unit that breaks microbes apart, then passes them through the filter and into the combustion chamber where they are burned with the fuel. The ECO-FUEL ECONOMIZER unit fits securely and quicly into the primary fuel line and eliminates the need for biocides in diesel tanks. Similar to Cetane boosters or diesel additives, our fuel conditioners break down the paraffin and asphaltenes naturally found in diesel. Our units help keep them in solution to be burned cleaner and more efficiently for optimum economy and performance. We invite you to let one of our transportation consultants show you how we can tailor a solution for your company's current and long-term needs. Please call today - 956-289-1406.